Today I'm in the studio playing with a few of my new Memory Box die-cuts. My latest order arrived from Simon Says a week or so ago and I've been going through them slowly - just taking my time to figure out what I wanted to do. I bought 22 new die-cut --- yes, I went a bit crazy, but I liked so many and couldn't just order a few. Today's card uses the "Prim Poppy" die-cut. It's so pretty! When I pulled it out today and looked at it, I knew right away that I wanted to try it with the paper tole technique (click here to see my tutorial). I used DP from the Everyday Enchantment series for the poppies and for the frame ... just a beautiful Poppy Parade pattern, but it's hard to tell in the photo. Hope you like. I ran Old Olive cardstock with the Prim Poppy die-cut through my Big Shot. I ran the die-cut through two more times with the Poppy Parade DP. I cut the heads from the DP poppies and sponged around the outside of the flower heads with Real Red ink to give them depth. I placed the first layer of poppies heads directly on top of the Old Olive base, attaching the flower heads with small dots of glue. For the second layer (again using flower heads that are sponged with Real Red ink), I placed two rolled glue dots on each side of the flower, near the top and a small amount of glue at the base of the flower head. I placed them on top of the base. I brayered the Whisper White card front on the diagonal with Daffodil Delight ink. I used my Stamp-a-ma-jig for placement of the sentiment and stamped it in Old Olive ink. 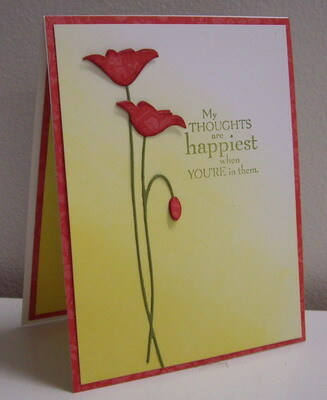 I used more Tombow glue (just a little) to mount the layered poppies onto the card front. I mounted the main panel onto a frame of Poppy Parade DP and then mounted the whole card front onto a base of White. Labels: brayering, CAS, friendship, love, memory box, paper tole, sponging, Stampin' Up! Love your card! I too recently purchased this die and really like the delicacy of it. I shall stay tuned to see what else you do with your new dies. I have the tulip also and have almost worn it out!